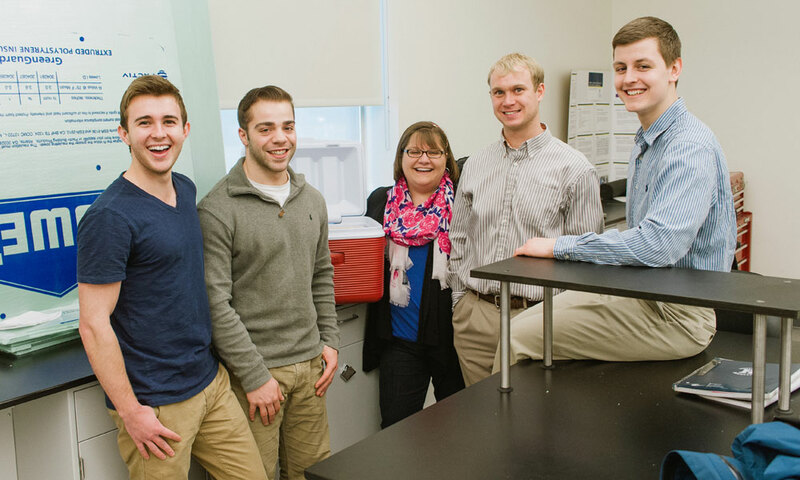 Biomedical engineering seniors Casey Dahlbeck, David Abplanalp, Courtney Astemborski, Chad Pickering, and Max Winkelman, the team behind Project Hemo-Box, a redesigned blood transport container for the Medical Center's blood bank. Medical devices, a small wind turbine, a motion-sensing robot, and even a re-designed lava lamp. They’re all part of the many innovations featured in this year’s Hajim School Design Day at the University of Rochester. Seniors at the Hajim School of Engineering and Applied Sciences have spent much of the school year partnering with local companies and institutions to solve real-world engineering problems in the fields of medical devices, alternative energy, optics, and more. Their innovations will be on display Friday, May 2 from 10:30 a.m.to 1:30 p.m. in the Goergen Center Athletic Field House. WHEN: Friday, May 2 from 10:30 a.m. to 1:30 p.m. PARKING: Media should stop at the information booth near the Elmwood Avenue entrance to receive a parking pass and directions on where to park. NOTE TO MEDIA: A short video provides a glimpse of the projects that typically make up Design Day.